Frankly speaking, I never had this dessert until quite recently when I started working.. I remembered then, I need to stay and dine in the hotel for months and that’s how I get to know this sweet, smooth and cold dessert from the then Holiday Inn Damai Beach. Since then, on and off, I can only order from hotels and restaurants in West Malaysia or those selling Malay or Nonya cuisines. Apparently, it was not being sold in hawker centre and definitely not as common as other local desserts such as Ais Kacang Batu or Chendol. 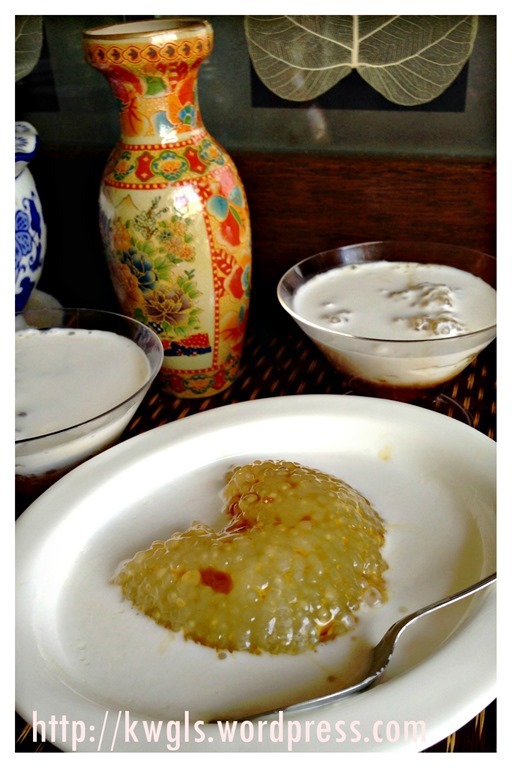 “Sago /ˈseɪɡoʊ/ (Tamil : ஜவ்வரிசி) is a starch extracted in the spongy centre, or pith, of various tropical palm stems, especially Metroxylon sagu. It is a major staple food for the lowland peoples of New Guinea and the Moluccas, where it is called saksak, rabia andsagu. 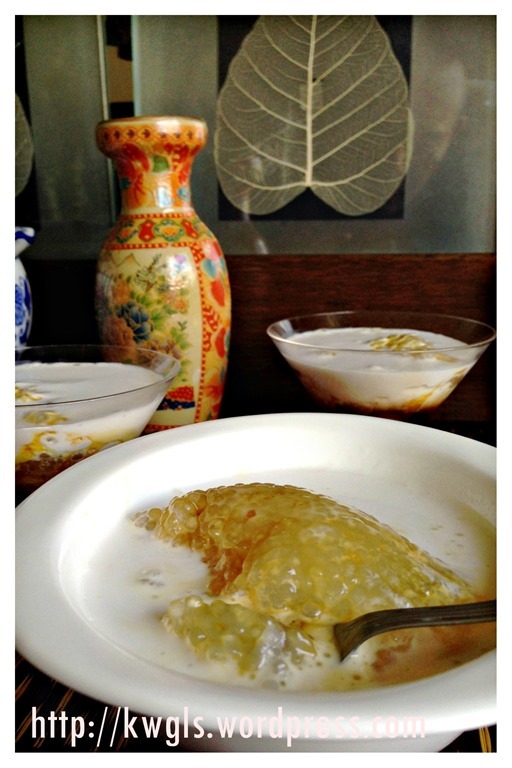 A type of flour, called sago flour, is made from sago. 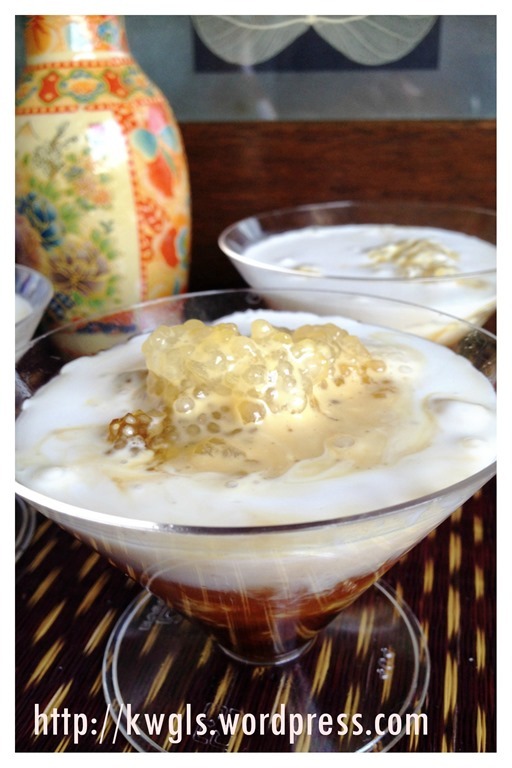 The largest supply of sago comes from the East Indies. 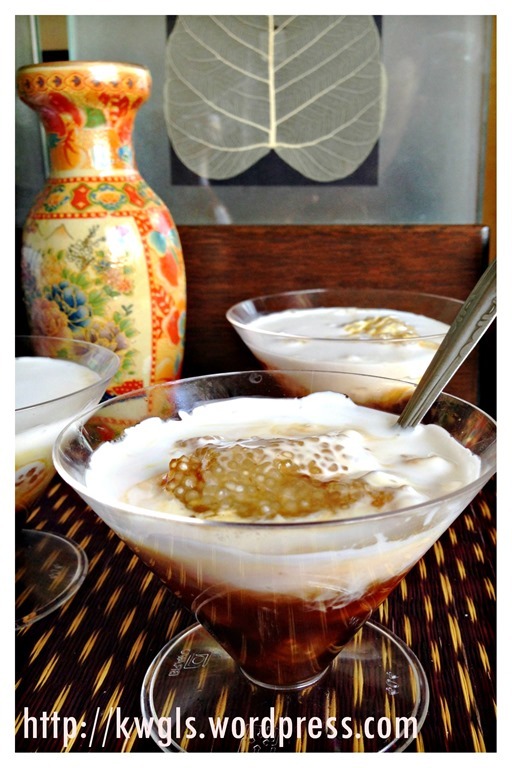 Large quantities of sago are sent to Europe and North America for cooking purposes. It is traditionally cooked and eaten in various forms, such as rolled into balls, mixed with boiling water to form a paste, or as a pancake. 2-3 leaves of Pandan or screw pine leaves. 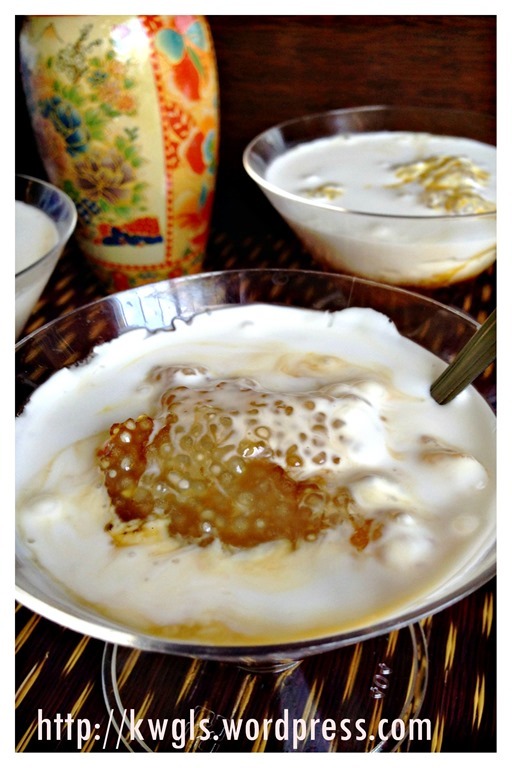 Soaked the sago pearl balls with adequate water until they fully expand which took about 10 minutes. Meanwhile, boil a pot of hot water. Add in the soaked sago pearls and stir the sago pearls in the hot water. Note that constant stirring is required throughout the cooking process. During this process, you will witness the water become starchy like glue, keep stirring for about 10 minutes until all the balls looks translucent. Off the heat and cover the pot with a lid. Let is rest in the pot for at least 5-10 minutes before transferring out for draining. The resting in the pot is to let the remaining heat continue to cook the sago balls including the centre. You can always add in cold water throughout the process if you found that it become overly sticky. Once done, drain the balls in a big sift. 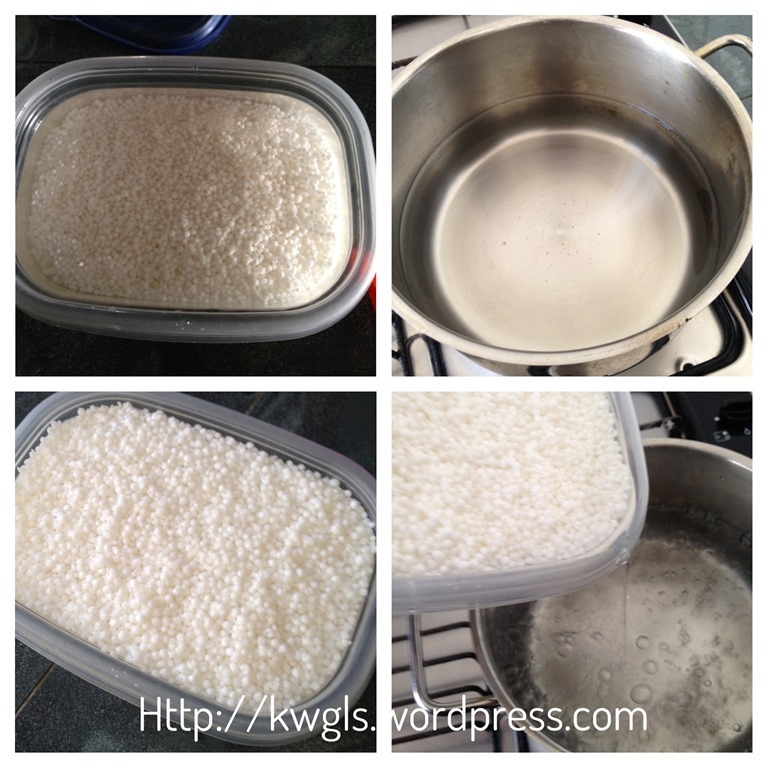 Use running cold water to rinse the cooked sago balls and wash of the excess starch. 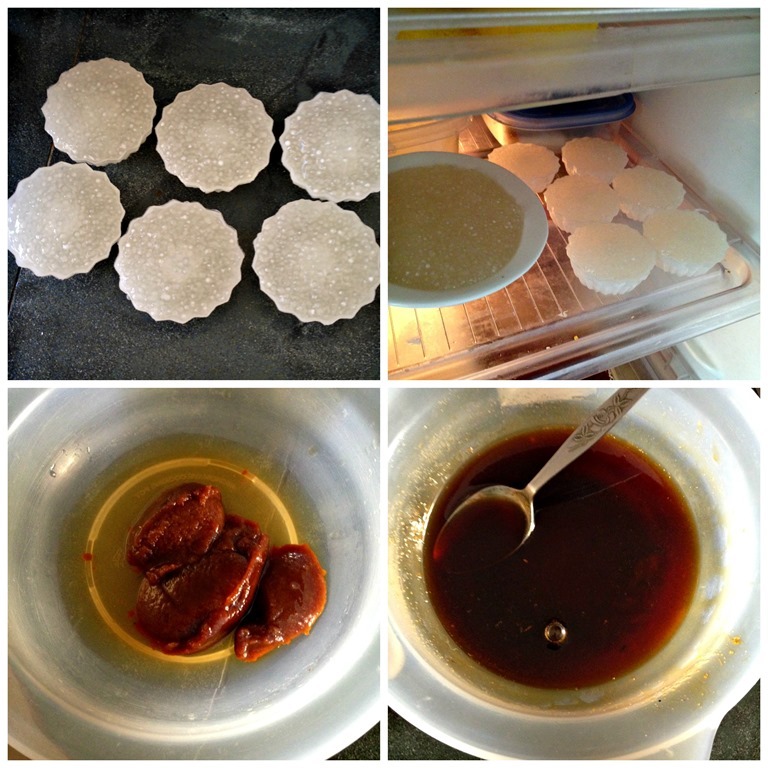 Transfer the cooked sago balls into the desired moulds or bowls, cooled and if prefer, put inside the fridge for chilling until the sago balls are “set”. 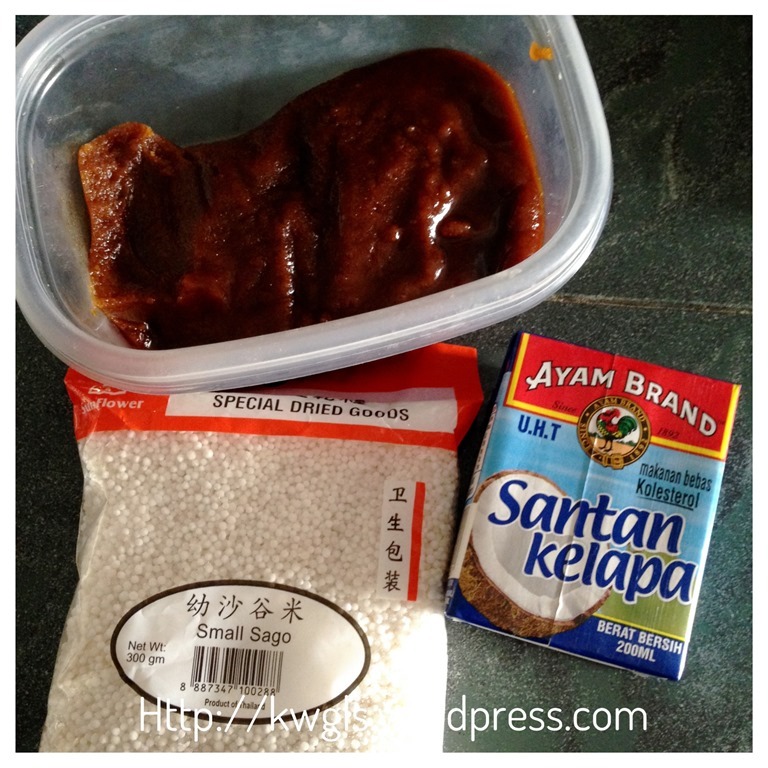 For the palm sugar (in this illustration, I have used gula apong), add 3 tablespoons of water to the palm sugar and microwave for 30 seconds to one minute. Stir until the sugar had completely dissolved. 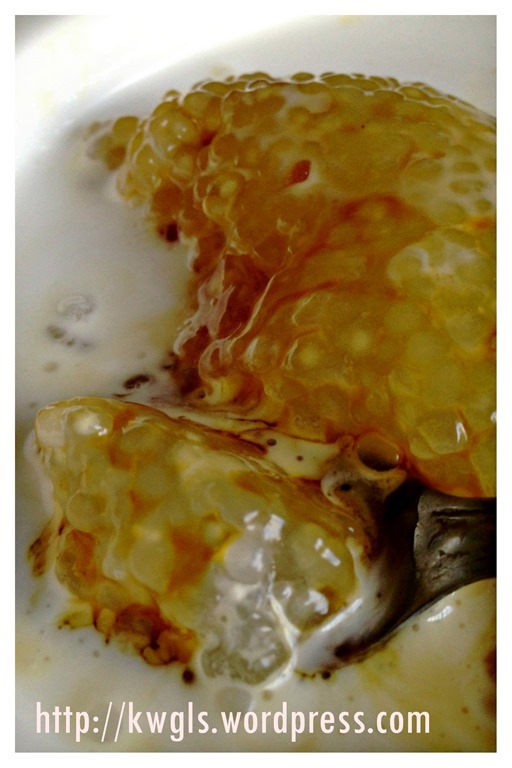 If you do not have a microwave, melt the sugar over the stove under low to medium heat until it dissolves. 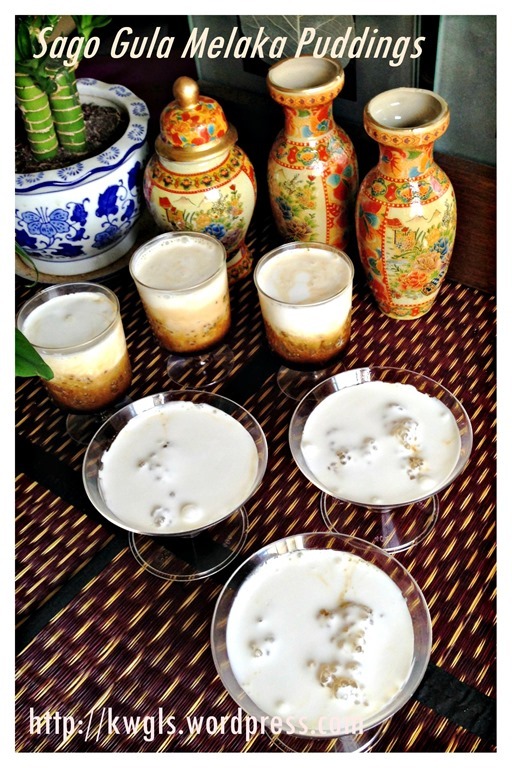 For coconut milk, cook the coconut milk with pinches of salt and pandan leaves under medium heat until it boils. Once boiled. Off the heat and let it cool. 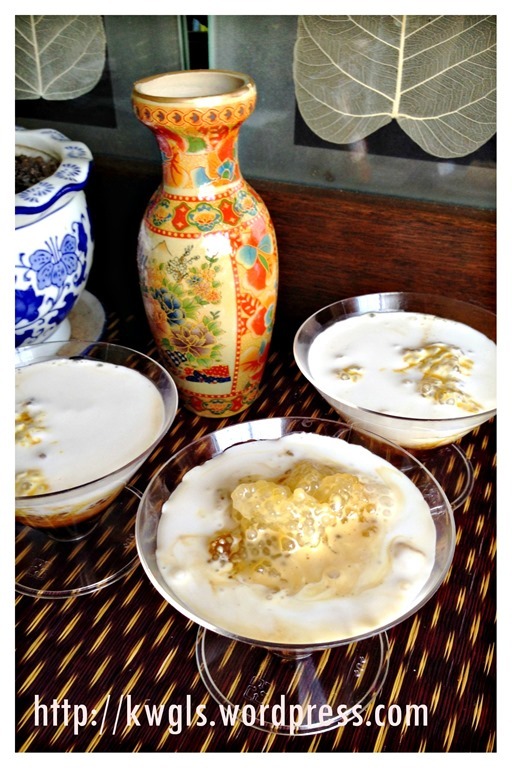 For assembly before serving, take a bowl of sago pearls, put some coconut milk and followed by your desired amount of palm sugar. Best served when chilled. 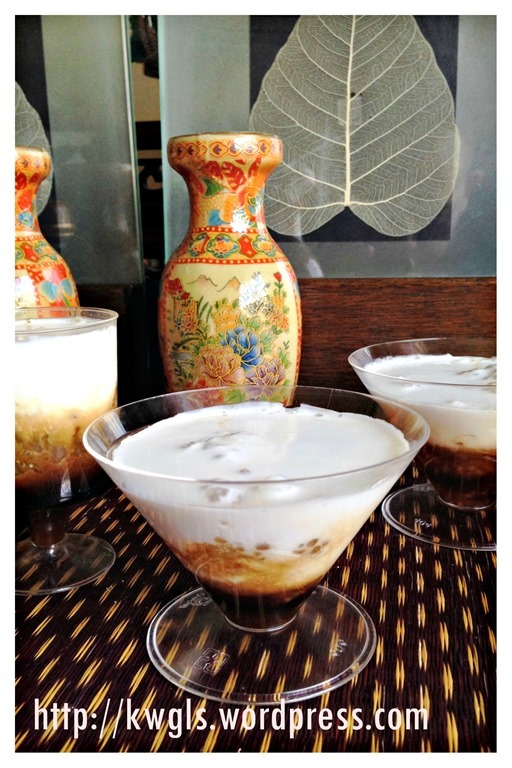 A simple 3 ingredients local dessert and I love the dessert for its smooth texture and rich coconut aroma. 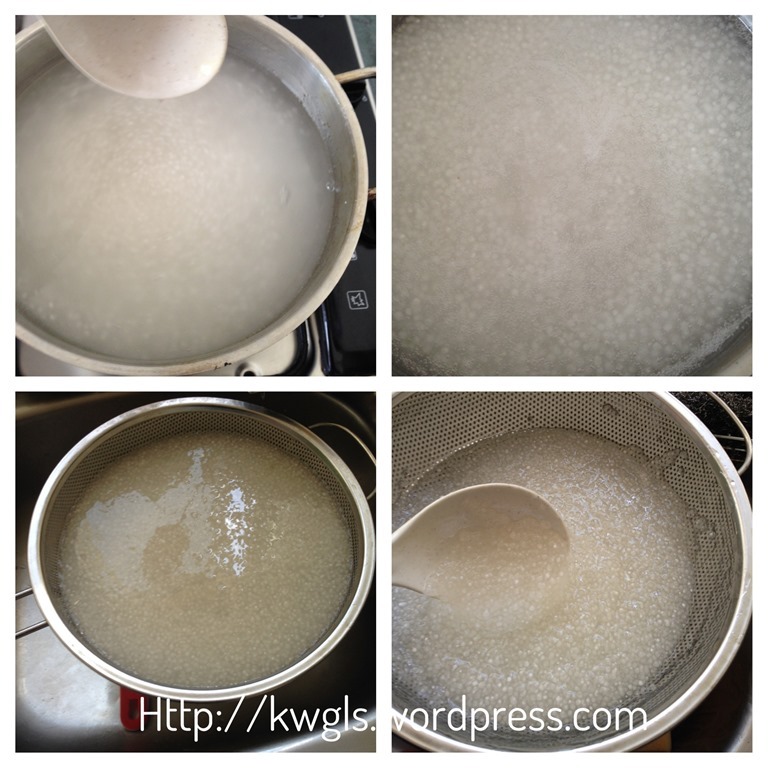 Do give it a try and remember to let the sago balls to sit in the pot before draining to avoid centre uncooked sago balls. 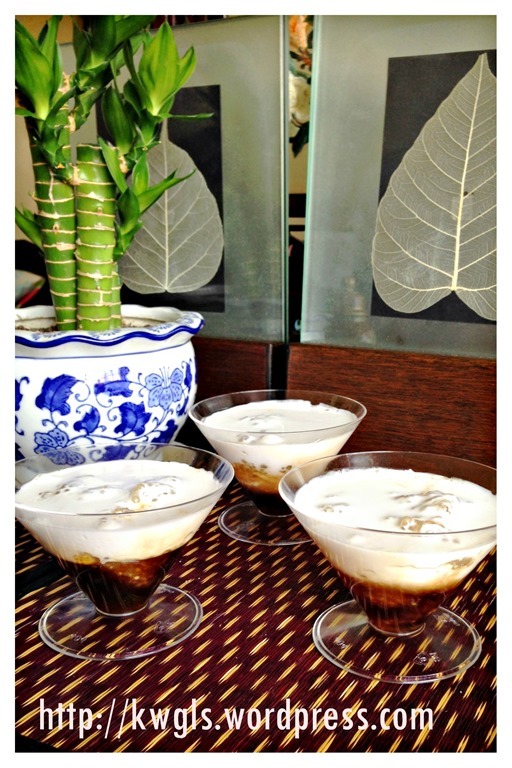 This entry was posted in Chinese and Asian Cakes and Snacks, Desserts, Food Preparation Series and tagged GUAI SHU SHU, Guaishushu, kenneth goh, postaday, Sago gula melaka, sago puddings, 椰糖西米露， 8. Bookmark the permalink. This is delicious! Just visiting from the hop!